As part of its current Marvel Legacy initiative, Marvel Comics is releasing one-shots that check in with series of the past, including Master Of Kung-Fu, Silver Sable & The Wild Pack, Darkhawk, Not Brand Ecch!, and Power Pack. That last one is especially exciting given that it features the return of writer Devin Grayson, a fixture of ’90s and ’00s superhero comics who is writing her first superhero story since a short in 2010’s Girl Comics. 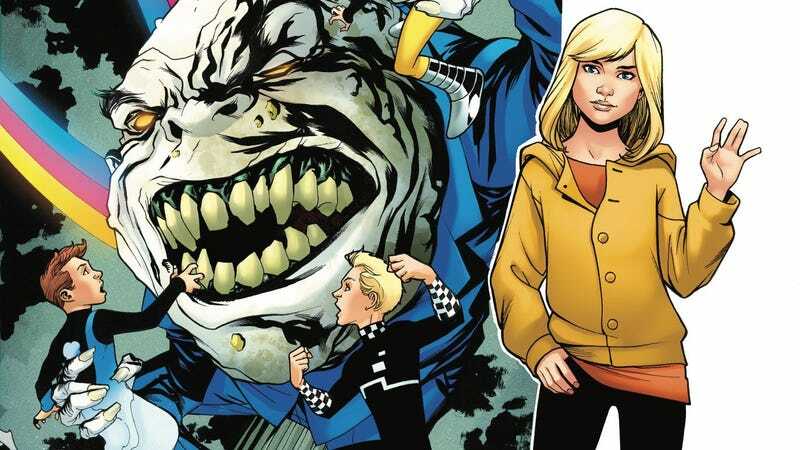 She teams up with artist Marika Cresta and colorist Chris O’Halloran to bring back the kid superhero team that captured readers’ hearts back in the ’80s, and Power Pack #63 catches up with where the team members are now. The one-shot takes place shortly after John Allison and Rosi Kampe’s Power Pack story in Civil War II: Choosing Sides, with Julie Power in college, Jack and Katie Power living at home with their parents, and older brother Alex out exploring the Multiverse with the Future Foundation. Grayson’s story focuses on how Katie is dealing with the changes to her family unit, but also serves as an introduction to the team for readers who got into comics after Power Pack’s heyday. This preview of next week’s Power Pack #63 gives readers a rundown of the team by looking at one of their past showdowns with the Bogeyman, a monstrous villain with the ability to possess other people. Marika Cresta makes her Marvel Comics debut with this issue, and these preview pages reveal a very promising talent that understands how to create dramatic images and rich character expressions. Cresta trained under Marvel artist Sara Pichelli, and there’s a lot of similarity in their two styles, which is a very good thing considering Pichelli is one of the best storytellers in superhero comics. Chris O’Halloran, another rising star who has quickly been gaining more and more assignments, elevates Cresta’s linework with his bold colors, and the shot of the assemble Power Pack on the first page captures the bright, exciting energy that made the team such a delight when it originally debuted.